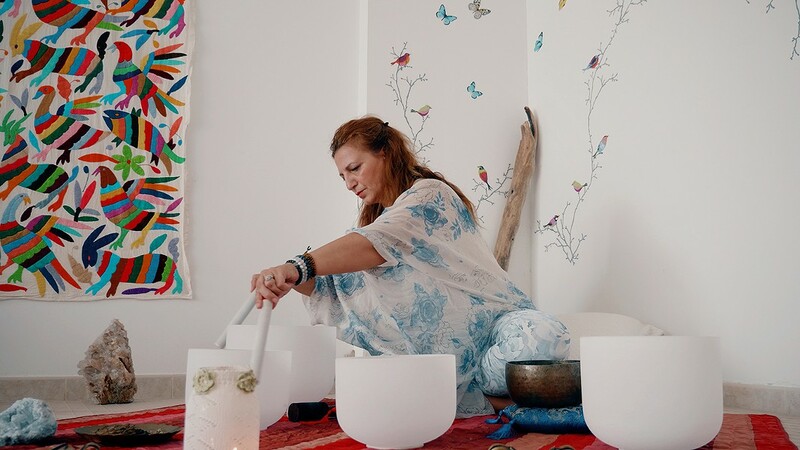 Donatella Moltisanti is bringing her sound healing practice to the Bay Area this month. Donatella Moltisanti says music has helped her through hard times. Just as it has done for many of us, music has helped Donatella Moltisanti through hard times. But for her, the benefits were even more concrete than just feeling emotionally uplifted after shouting along to a fun pop song. But breathing techniques she learned from opera helped the pain dissipate. “I started to do regular breathing and understand how this technique transforms the body into an instrument. I didn’t know what was technically happening, but I had less and less pain,” she explained. Today, the alternative health practitioner heads a wellness company, VitalitySoul, where she teaches people her Moltisanti Soul Healing method, a six-step process that helps individuals let go of residual trauma and express themselves honestly. The cornerstone of this healing method is her Moltisanti Soul Singing. “I use ancient techniques of sound that really awaken the innate intelligence and integrity of the body,” she said. Soul singing fuses classical opera, sacred Eastern music, and improvised vocalization. To the skeptical reader, this may sound a little far-fetched — but research actually shows that singing and listening to music have health benefits, from increasing oxytocin output (which is mood-boosting) to releasing dopamine. These can also provide stress relief by soothing the amygdala, the section of the brain that is responsible for detecting fear and preparing for emergency events. According to Moltisanti, the urge to share her discoveries comes from her Sicilian roots. She grew up with a large family and community, so a culture of sharing has been ingrained in her since birth. Now, she is spending a week in February touring the Bay Area with a series of events on music as medicine, pairing up with local doctors whose scientific research backs the healing power of music. The first event, “Can Music Change Your Genes?” takes place in San Leandro with Dr. Kenneth R. Pelletier, a UC San Francisco School of Medicine professor and best-selling author. At the event, Dr. Pelletier will discuss how sound healing is one of numerous practices that can switch off the expression of disease genes and switch on the expression of healthy genes. Moltisanti will then lead a meditative exercise with crystal singing bowls and guided meditation. Another event, “Experience Forgiveness” with Dr. Fred Luskin, a Stanford University professor who has researched the health benefits of forgiveness and stress management, was scheduled in Emeryville — but has since been cancelled. But the two have organized events together before, and this probably won’t be the last opportunity to see them. The Bay Area has been particularly receptive to Moltisanti’s unconventional healing methods. Sound baths, in which a yogi leads meditation therapy using various instruments from chimes to crystal bowls to gongs to tuning forks, are growing popular in yoga studios in the East Bay, such as at Alameda’s Leela Yoga Studio and Oakland’s Bliss Fitness & Health. “There is an openness to the secular world joining the religious spiritual world that in other parts of the country, at least in the past, was harder to blend,” Luskin explained. Moltisanti, who is based in New York City, said her most receptive, engaged groups have always been in the Bay Area. But over the past few years, she’s started to see the sound healing trend pop up everywhere. If you can’t make it to one of Moltisanti’s meditative “soul singing” events, she also offers video classes. But at the most basic level, she says everyone can incorporate the healing power of music into their daily lives.